Do you prefer following elk tracks instead of footprints? Do you often seek the off-the-beaten path type of adventure? If you prefer coyote howls and dark starry skies over campgrounds and crowds, you will love the Heart of Darkness Loop in the Ochoco Mountains! This loop offers a rugged and breathtaking 39 miles of backpacking through some of eastern Oregon’s most remote and scenic landscapes. This strenuous hike is full of adventure and inspiration and offers a unique alternative to the often over crowded trails plaguing central Oregon’s Cascade Mountains. For those seeking adventure and solitude, this is the place to go within a few hours of Bend. Lace up, and get ready for adventure! Distance: ~39 miles and 4 days. Rock Creek TRAILHEAD INTO ROCK CREEK DRAINAGE ON OCHOCO MOUNTAINS/ROCK CREEK TRAIL #823. Description: From the trailhead at Rock Creek, the trail drops 0.4 miles down into Rock Creek, where it crosses a sturdy footbridge onto the north bank. For the next two miles, the trail parallels the north bank, staying 10’-50’ above the stream. Pure stands of larch are on the moister, north-facing slopes, with mature ponderosas on the drier, south slopes and lodgepoles and willows along the stream. At 2.4 miles, a small interpretive sign announces the Waterman Ditch, a now defunct diversion of Rock Creek that was contoured around the hillsides in the 1890’s to reach a gold mining district ten miles away near Spanish Peak to the north. The trail then follows this old mining ditch on a level grade for 1.4 miles to Fir Tree Creek. In this section of trail, there are great views up and down the canyon. After crossing fir tree creek, the trail goes back downstream along the creek on the other side.There are the remains of an old log cabin built by the miners. The trail continues for another 2.5 miles. You cross Second creek, then First creek. About ¼ mile after crossing First creek, you will see a sign on a tree that says Rock Creek Trail #823 at around the 7 mile mark. If you look to the east, there is a small hidden sign in the forest that indicates the branching off to the Rim Trail #822. The trail is not visible at this junction. If you continue past this junction about 100 feet, you will see a slightly impacted camp site in a lovely grove of old growth pines with a fire ring. If you start to descend down from the saddle past this camp, you’ve gone too far. Leaving your beautiful camp on the saddle above Rock Creek Drainage, you start the gradual climb up Spanish Peak with stunning views in all directions. From camp, the trail is difficult to find and overgrown for the first couple of miles. You want to track south from the camp nearly getting back into First creek drainage and start the climb uphill from there. If you lose the trail, keep making your way gradually up through the open stringers of prairies and it will become very obviously marked with huge cairns through open prairie after a couple of miles. The trail will circumnavigate around the summit of Spanish peak to the south, taking you through fir and pine forests and natural springs. At ~4 miles in, you walk through an incredibly unique ecosystem that is transitioning from fir forest into a mahogany field with abundant wildlife and plant diversity. Worth taking a lunch break here and taking in the scene. 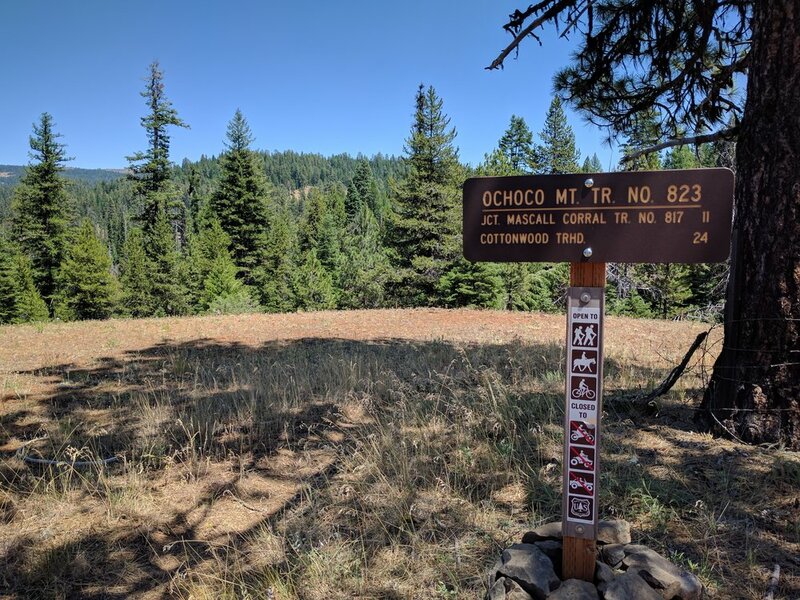 At ~5 miles you will come to the Spanish Peak road and a find sign stating Ochoco Mountains Trail #823 and a sign for Cottonwood Trailhead in 11 miles. Shortly after starting in on this trail, you will find another sign indicating the Rim Trail #822. The Rim Trail #822 and the Ochoco Mountains Trail #823 are often used interchangeably on the signs, but they are one in the same. The OMT#823 continues along a forested rim gradually descending for about 3 miles before crossing the John Day Basin road at 8 miles. Another 2 miles and some steep descents will bring you to Buck Creek, the first water source since leaving First Creek in the Rock Creek drainage. There are peaking views of the Black Canyon along these two miles, and an overall increase in disturbance from cows grazing on public lands. Continue to gradually descent another 2.5 miles to Cottonwood Creek. The scenery changes from more scablands to forested while along cottonwood drainage. You climb from here 1 mile up the trail before you cross Tin Cup Spring/creek. Here you will see an old dispersed camp site adjacent to the trail with an overgrown fire ring. It makes for a nice camp after a very, very long day. There is a dispersed site along Spanish Peak Road at mile 5. You would need to bring extra water up from Rock Creek or stash water at this site before departing your trip. When crossing John Day basin road at 8 miles. You would need to bring extra water up from Rock Creek or stash water at this site before departing your trip. A ¼ up from Cottonwood creek in open field. From here it is only another mile to the camp at Tin Springs which is more forested and scenic. From the campsite along Tin Cup Spring, you gradually climb for ~2 miles to the Cottonwood Trailhead. From there you cross the 38 road and start your descent on the Payten Trail #820D to Big Ford and the Black Canyon Trail. Payten Trail steeply descends into the Payten Creek drainage through sections of grassy ponderosa pine forest and dense mixed conifer forest. There are periodic large old growth pines dotting the trails as you descend into a rugged wilderness area. 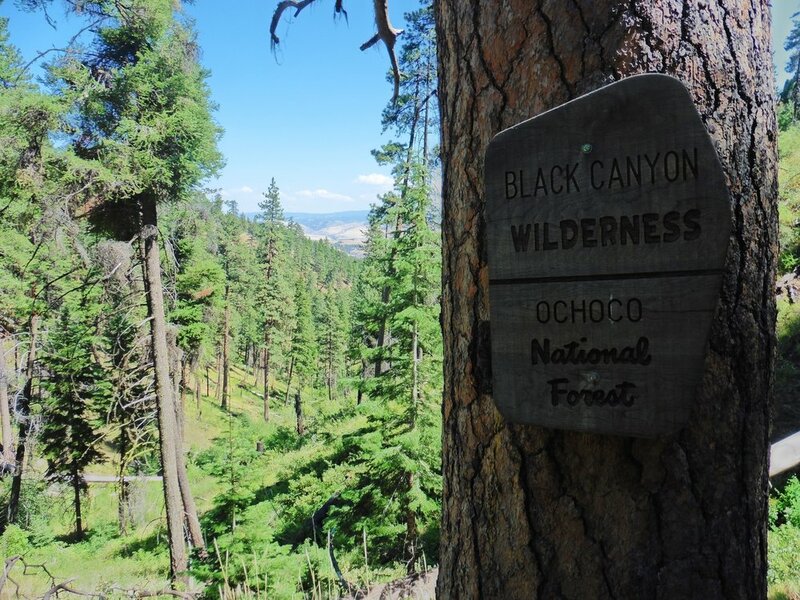 You hit the Black Canyon Wilderness boundary at approx 1 ½ miles. You hit a series of switchbacks that descent and connect with Black Canyon Trail #820. Continue up the Black Canyon trail .2 miles to the South Prong Trail #821. Just past this site there is an open meadow below the trail adjacent to Black Canyon Creek in an old growth pine grove that makes an excellent camp in a truly remote and rugged wilderness. The trail stays high above Black Canyon Creek for the first part of the day. About 1 mile in there is the intersection of Kelsey TH (although not visible). After this, the trail drops closer toward Black Canyon Creek and goes up and down around natural springs and lush and thick understory for another 3 miles until you hit the Coffee Pot trailhead junction. This is obviously marked with white diamonds on the trees. You cross Black Canyon Creek a couple times during this stretch, and the riparian areas offer a nice respite from the dry day of hiking the day before. Hiking through this section of Black Canyon Wilderness, you experience various stages of the forest post wildfire. Some areas have burned more recently than others, and you see the varying levels of succession and early seral species, abundant understory, snags used as nesting cavities. There is downed logs in the stream creating fish habitat and in general lots of sign of wildlife. It’s a very interesting and beautiful hike. You continue to gradually climb for another 2 miles and wrap around to the SW along Owl Creek until you reach a section of the wilderness that is more intensely burned. You will hit a trail junction with Owl Creek Trail #820A and follow that for .5 miles to the Boeing Field TH and edge of the Black Canyon Wilderness. You can walk the 5810 road north until the junction of the 38 road. Take the 38 road and head west until you get back to the Rock Creek Trailhead after about 4.3 miles on road. If you bring two vehicles out, I would stash one at the Boeing Field trailhead and avoid the road walk at the end of the trip. Follow Highway 380 past Paulina for 58.7 miles. Turn left onto Beaver Creek Road and follow for 7.5 miles. Merge onto forest road 42 for 1.5 miles, merge onto forest road 3810 for 6.5 miles to forest road 38. Turn right, follow forest road 38 for 3.5 miles to the well marked Rock Creek Trailhead on the left.